Beat Bugs Motion-Mania - Rock'n Roll Crick - Wind him up and watch him kick! Rock'n Roll Crick is part of a collectible series of 5 beat bugs ™ Motion-Mania Toys that were inspired by songs made famous by the Beatles. Colors in photos may vary from actual due to variables like lighting, camera flash, monitor resolution, etc. Please email your questions, and let's work together to ensure that this purchase is right for you. *All items sold are marked with either a 1/2 inch Foil Numbered Security Sticker or an orange tag. Any tampering, damage or removal of the security sticker or orange tag voids any Returns or Refunds. 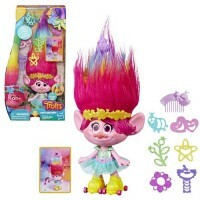 Cute, cute, cute Party Hair Poppy Troll by Hasbro is ready to roll in her glittery net skate outfit .. Kinetic Sand Sandcastle Set (Box Set) Create a sandcastle seascape with easy clean kinetic sand - .. Beat Bugs Motion-Mania Whoop It Up Kumi - Wind her up and watch her go! Whoop It Up Kumi is part of.. Beat Bugs Motion-Mania Skateboarding Jay - Pull back and watch him ride! Move Jay front for speed a.. Beat Bugs Motion-Mania - Rope Jumping Walter - Wind him up and watch him jump! Rope Jumping Walter .. Beat Bugs Motion-Mania - Biking Buzz - Wind her up and watch her ride and turn! Biking Buzz is part..